Clarity of vision is something we all seek, particularly as we grow older and face such hindrances as cataracts, “floaters,” macular degeneration, and other eye conditions that come with aging. Many people courageously and effectively face the challenge of vision loss, but we all would prefer to see clearly, to be able to appreciate beautiful things and recognize—and avoid—dangerous situations. As important as physical vision is for our lives in this world, there is another kind of “seeing” that is even more important. Throughout the Scriptures, the Lord called people to recognize His love and lordship. When people “saw” and followed the Lord, their relationship with Him was healthy and secure. But when they followed their own whims and foolishness, they fell into all sorts of difficulties. Then God would become angry with them—not the anger of hatred, but the anger of love and grief, the anger of a loving parent who seeks to keep a wayward child safe. In Christ Jesus, our Lord continues to call us to come to Him, to see His mercy and love for us, to recognize that He alone is the way to eternal joy and life. 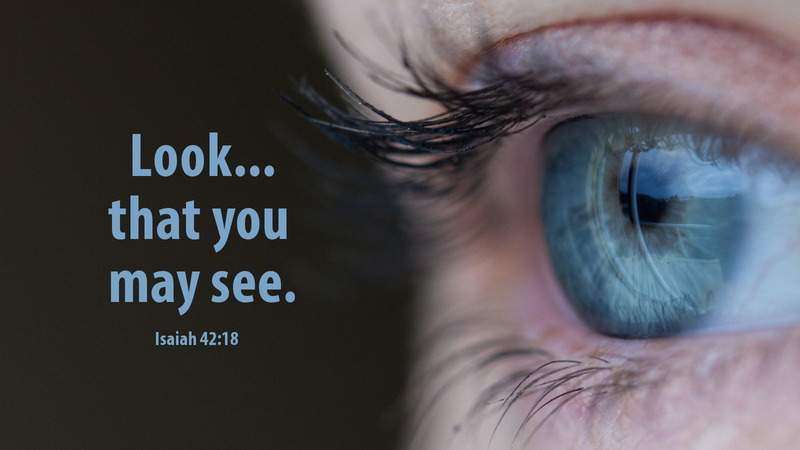 Prayer: Gracious heavenly Father, open the eyes of our hearts to see your love and to recognize the salvation you offer us in Christ Jesus, your Son, and our Lord. Amen.